How much snow did Mt Baldy get today? Find the latest snow report for Mt Baldy, with ski conditions, recent snow totals and snowfall in the weather forecast. Scroll left to see the most recently recorded Mt Baldy snow totals for the last five days or scroll right to see the Mt Baldy snow forecast for the next three days. Read the snow reporter comments (if provided) for more details on skiing at Mt Baldy for the day. See base depth recorded at the upper mountain, mid mountain and lower mountain stations, along with the current weather at the summit and base elevations, including wind speed and direction. Click through for a full weather forecast. How many lifts are open and how many runs are open at Mt Baldy? Check out the Mt Baldy ski report, including number of lifts open, acres open and runs open, as well as the terrain park status. 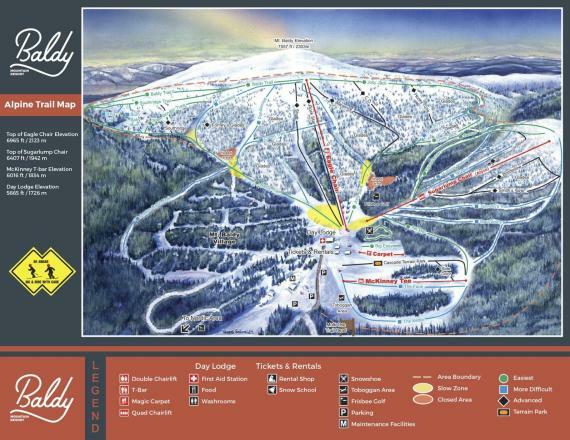 Click Add to Compare to see a side-by-side comparison of Mt Baldy vs. other ski resorts (up to 10 total). Mt Baldy snow reports are sourced directly from the ski resorts and are only recorded during the official ski season's opening to closing dates. hopefully everyone showing faith in Baldy will be rewarded soon with pass sales and something from the hill to say thank you. the self described social media expert seems to have been silenced. i guess the management "team" was not happy with they way he was handling the pressure about season passes. 2 more days before the pass holder exodus. this place needs some financial stability. if passes aren't on sale yet then i doubt we will be riding the chair lifts soon. too bad. as a cabin owner of 20+ years it would be nice to know when passes are going to be on sale. season pass holders are majority of your customers. you can't afford to lose them.